After a fair bit of excitement in recent days regarding East Pacific Hurricane Rosa–which is now weakening rapidly as it takes aim at the far northern coast of Baja California (about 200 miles south of San Diego–among the most northerly NE Pacific landfalls on record)–it now appears that *most* of the remnant moisture from this system will miss Southern California to the east. Scattered showers and thunderstorms wrapping around Rosa’s remnant circulation will be possible in far southern California–brushing San Diego and especially the interior desert regions (the Imperial Valley and points eastward, where heavy rainfall is possible). But the majority of Rosa’s copious tropical moisture now appears destined for Arizona, where widespread heavy precipitation and flooding now appears likely. The truly extreme rainfall projections from just a few days ago have (fortunately) moderated a bit even in this region, but several inches of rainfall occurring over a broad area in a very dry region will still bring the potential for some significant flash flooding at a time of year when that’s far less common than during the monsoon season. Rosa is still making a pretty close approach on Southern California, however, and the rather striking “radial cirrus” clouds currently being observed over far SoCal are indeed directly associated with the upper-level outflow from this hurricane. But outside of tropical showers near the Mexican border and some larger surf along the SoCal beaches, Rosa now appears unlikely to have significant impacts in California. One of the reasons that Rosa will ultimately have less of an impact on SoCal than previously anticipated is that an incoming Pacific low pressure system offshore is now expected to be deeper and stronger than had initially been captured by the models. But although this means that Rosa will eject more quickly to the east, it also may ultimately mean that a larger fraction of California actually experiences significant rainfall this week. The system developing offshore will become unusually deep for this early in the season, and now appears likely to generate a modest atmospheric river with a robust subtropical moisture tap. Interestingly, it appears that almost none of this moisture will be associated with Rosa–instead drawing from a broader region of anomalous atmospheric moisture content to the southwest of California. This area of low pressure will slowly advance toward southern California, eventually moving ashore toward mid-week. As it does so, it will drag a pretty robust frontal boundary across the southern half of the state. Significant rainfall now appears likely from about the SF Bay Area south to Los Angeles County, with at least some precipitation pretty much statewide. More importantly, it appears that this frontal passage could be characterized by an unusually convectively unstable airmass. This means that thunderstorms will be a pretty good bet somewhere along the CA coast–perhaps most likely along the Central Coast into LA County. Very high rain rates will be possible if and when this occurs, which raises the possibility of flash flood and debris flow risk near recent burn scars. The memory of the devastating Santa Barbara County debris flows downstream of the Thomas Fire burn scar in January 2018 is still fresh–and many folks in that area are understandably sensitive to discussion of further risk. Unfortunately, given the potential for high rain rates and thunderstorms after a long, hot summer, this event probably will pose at least some risk of new debris flows or flash floods in this region. While the exact level of risk may not be clear until 24 hours before the event, I’d strongly encourage folks in the area to pay close attention to NWS forecasts this week. Heavy downpours and isolated thunderstorms are possible nearly anywhere in California as this early season storm moves ashore mid-week–so there could also be a localized risk of flash flooding near other recent wildfire burn scars (including those in Lake and Shasta counties). The risk in areas outside of SBA/VTA Counties does not appear to be especially alarming with this particular system, though the risk could be much higher in these areas during subsequent systems this winter. Despite the risk of debris flows near recent wildfire burn scars, I actually think this incoming weather pattern shift stands a good chance of bringing more net benefits than hazards to California. Chiefly: this unusually early shift to wet and cooler conditions may act to substantially dampen what has been a devastating fire season to date in many parts of the state. 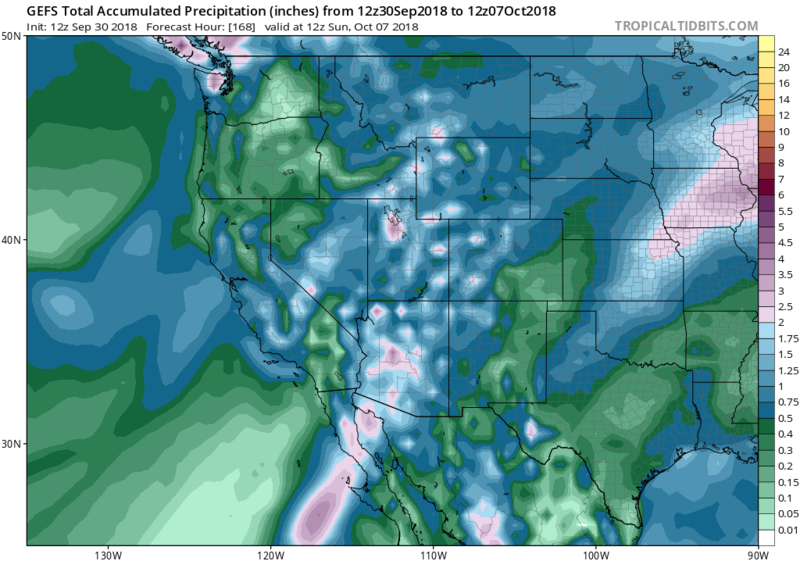 Widespread “wetting rains” are expected this week across most of California, and more precipitation is possible by mid-October. Substantial snowfall is even possible at pass level in the Sierra Nevada! This is good news in a fire-weary state. Recall, just last year, the devastation wrought by the North Bay firestorm in October–and the subsequently massive Thomas Fire in Southern California that burned straight through the month of December. It’s unlikely that either of those fires could have become the disasters they ultimately did had this week’s weather pattern occurred at the same time last year. Instead of the record heat and desiccating Santa Ana/Diablo winds of last October, this month appears to be getting off to a relatively damp and cool start during what in many years is the peak of the California fire season. I don’t think too many people will be complaining this time around! Is all this excitement thanks to El Nino? Nah. But there are some pretty amazing atmospheric goings on at the moment. In recent days, one of the strongest “blocking” high pressure systems observed in decades anywhere in the Northern Hemisphere has taken up residence over Alaska, bringing a rather extraordinary string of record-breaking warmth even into the high Arctic. Impressively, this high pressure system is expected to maintain is extreme strength over the coming 1-2 weeks. As it does so, a textbook “Omega Block” is expected to form over the North Pacific. Such blocking patterns are notorious for bringing unusual and persistent weather regimes to adjacent regions, and this block should prove no exception. While Alaska basks in relative (record) warmth and dry conditions, the Western U.S. will experience persistent and unusually early-season troughing. Many areas across the Mountain West may see earlier October snowfalls over the next 1-2 weeks than they have experienced in recent years, while the Eastern U.S. (even further downstream from the Alaskan blocking) will experience simultaneous record warmth. (It is interesting, and more broadly illustrative of the influence of long-term warming trends, that widespread record cold is not expected in the cold flow regime associated with the block, while record warmth is expected in both of the respective warm sectors) on either side of it. 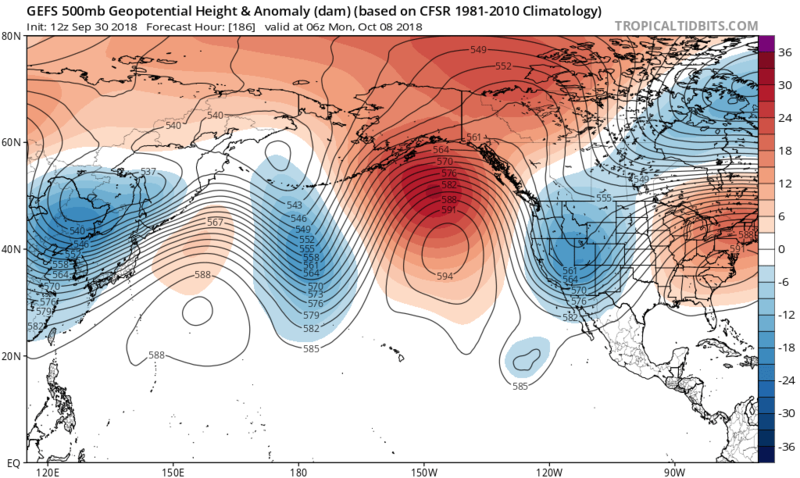 This upcoming unusual October pattern in California will likely stick around as long as the Omega Block persists–perhaps for the next 1-2 weeks. It’s still early enough in the autumn that warmer conditions could still return to California before the start of winter, and wildfire risk could rise again before the winer rains arrive in earnest. But for the next couple of weeks, at least, it looks like California may see a refreshing reprieve from the seemingly endless wildfire sieges of recent years.